Playing AAC format* is supported without any format change. (AAC format files in SonicStage CP can be transferred without being converted into ATRAC format). The Artist Link Shuffle mode is added to the Intelligent Shuffle. The clock display and calendar display functions are added. If you use CONNECT Player or SonicStage CP, the unit clock synchronizes with your PC when you connect the unit to the application software. The screen saver can be selected. Improved functions of the optional controller (RM-MC35ELK). Bit rate: 16 - 320 kbps, VBR (Variable Bit Rate) is supported. NOTE: Copyright protected AAC files cannot be played back. It is not guaranteed that all of AAC files can be played back even if meeting above conditions. The sorting order is based on the album track number rather than alphabetical order when you select Artist ALL from the Artist tree of the List search. The animation design which appears while the HDD is accessed is changed. The resume track information reset is prohibited during the recharge operation. Click the + button to read the Download and the Installation procedure. Read the disclaimer at the bottom of the page and click the Downloadbutton to download the program. Press and hold the BACK button until the HOME menu appears. Press settings , (up) / (down) / (left) / (right) to select (config) and then press (play). Press (up) / (down) to (Unit information) and then press (play). NW-A3000_V3_00.exe - 6,038 Kb . Check that the downloaded file is 6,038 Kb . If not, delete the file and repeat the download steps. Before updating the firmware, return all music files and data files of the unit to the computer. After firmware is updated, it may not be possible to use the music files and data files on the unit. 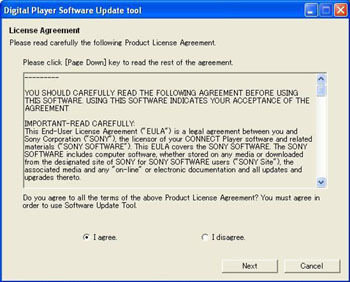 Sony is not responsible for music files and data files that cannot be saved on your computer due to the updating. Browse to C:\FWUP\NW-A3000_V3_00.exe in the Open text box and click OK. The program will be started. *If "Charge the device before performing the software update." is indicated, this means that the battery needs to be recharged. Then, update the firmware again. Connect the NW-A3000 to your computer and click OK. Please confirm the version when the upgrade program is installed successfully with the above steps. The upgrade program installation is succeeded when "3.00" is shown on the screen.